Final Fantasy VII Wallpaper: Last Hope! Minitokyo »	Final Fantasy VII Wallpapers » Final Fantasy VII Wallpaper: Last Hope! This wallpaper is dedicated to all Final Fantasy fans especially FFVII fans! featuring Aeris, I wanna give a special thank for a good friend of mine who helped me with the background :) and I'm glad how the wallpaper ended up! it tooks only 16 layers! I welcome any comments or suggestions!!! I updated the wallie, added some stars brushes and the sparkles around Aeris made them glow brighter! I think it looks better than before! oh this looks soooo cooL!! i love it!! grat bg and super scan!! great job from a grat artist!! keep it uP!! 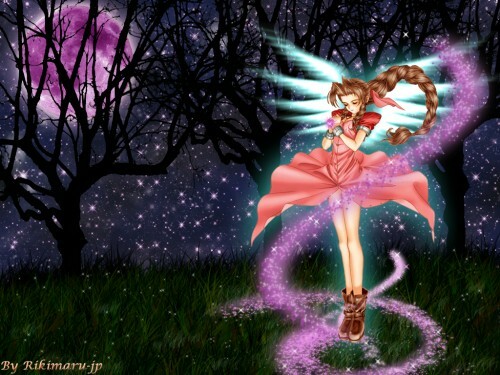 Aeris looks awesome in this one. But about her wings... they're a little bit too high. Lowering it a bit and placing more gap between both wing would make it look more consitent. But who cares, it looks fine to me. The lighting on the grass below her should be more wider. She's glowing ya see, so there's a source of light from above, and fromher height, I say an angle og 30 degrees opn the lightning should work. But again, what am I saying? It looks fine as it is. I like the mooon, it's all purple... ughghh... AWOOOOO!!!! All in all, great work, man. This oughta shut up those haters that't been gettin down on ya. Once again I say, it isn't Riki's fault that your walls are ancient and forgotten... fossilized, even. wow! that is so beautiful! you did a wonderful job on the background and the colors, i just love the trees and the sky! so powerful ^^ good job! Really really well done, I like the sparkles too. I think they are ok. This is a very specific shape for wings and Rikimaru placed them correctly. If they were a bit lower it would look really wired. Quote by jakulitoBut about her wings... they're a little bit too high. Very magical wall! I love the color of the moon and the shadowing or I should say highlighting of the grass =) And nice sparkle effect around Aeris. Wow! i love it! i like the background and the colors and all fits too good with the scan. You do it again boy, good job. Fav. WOW, this is definitely one of your best, great back and a cute scan, too. Thanx für this great wall. Quote by lthnadmlWow! i love it! i like the background and the colors and all fits too good with the scan. a lovely pic. poor aerith. its like she s on another plane already. btw i really wanted to the ff vii advent children. i heard its gonna be released on sept 14. what bout japan, is it already? keep doing this great job my friend! but overall it's a great wall. I really love the background it is very pretty.